Home > Reviews > Cases > "Whale"
As an ongoing exploration into the least expensive hardware that is available, this is another shining example of a budget driven system. 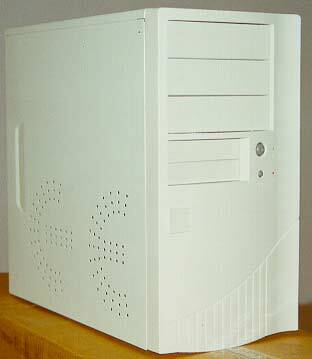 Sure a $300 supermicro case would be nice to have, but for those of us who are financially constrained, or only need the most basic of computer systems, this is a case that meets those needs. One of the most important aspects of any case, beside protecting your valuable components, is allowing for adequate cooling. More often then not, the usefullness of a case for overclockers will rest on this sole point. While there is space to attach an 80mm fan at the front of this case, only the smallest speaker-like perforations have been punched in the metal, and no perforations or vents exist within the front plastic bezel to aid in cooling. So any fan would essentially just move around the air already in the case rather then pulling in anthing resembling cool air. Curiously one of the side panesls has been punched with a series of vents that vaguely resemble the "CE" logo. While these vents appear to be well placed, the holes are so small, and the pattern spaced over such a large area the usefullness is dubious for convection cooling of any inside components. The powersupply is mounted on its side at the very top of the case right above where the CPU plugs into the motherboard. For overclockers with high heatsinks this may equate to a big headache. A small bit of venting is all that is included to aid in the explusion of hot air from the top of the case. The metal used to make this case is probably some of the most flimsy sheet steel I have ever come across. The side panels easily flex when being removed, and the case frame is likewise. In fact after installing the HDD I had to bend the whole rack back into shape!! 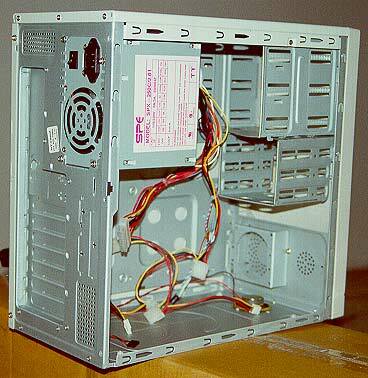 This is a one piece case, the motherboard tray [check], HDD rack - everything - stay put. The cover comes off in three parts and is held in place by screws. Sorry no tooless entry with this guy. The 250Watt powersupply only has 4 molex connectors and 2 FDD power connectors so it is a bit limiting, and not overly scalable. As if in hope that the case will be used for something other that a celeron of similarly low-powered processor, and comparative components, knockouts have been provided above the slots for SCSI, parallel, and serial ports. It would have made more sence to include better venting then these expansion ports IMHO.